If you arrived here because you are thinking about joining a running club then you have come to the right place. Why not come along to our Wednesday night training sessions and try out our friendly welcoming Club. Take out membership and enjoy the experience of Club running. Not sure if you want to join up - then try before you buy. Run with us as a guest for a few weeks before signing. See the How to Join Page for more info. The final races of the 2018/19 Birmingham Invitation Cross-Country League and Midland Women's League took place on 2 February, both teams running at Gloucester. In the men's race Northbrook's somewhat depleted A Team finished 7th on the day, the men's B team finishing 5th. After a promising start in the first two races, the team's strength was diminished by absences for various reasons in races 3 and 4, resulting in a disappointing overall 6th place at the series end. The men's B team ended the season 4th overall. Northbrook results ... At the National Cross-Country Championships at Harewood House on 23 February Northbrook fielded male and female teams, plus an enthusiastic and vocal support crew. On a tough, undulating 8km course Northbrook women finished 110th out of 274 teams. On a longer but equally tough 12km course Northbrook men finished 102nd out 360 teams. In the first 9 to score placings Northbrook men finished 65th. Northbrook results ... Baker's Dozen in the League Landmark List Having completed 108 races, with 2, 3 or 4 races completed in every season since 1987/88, Mark Baker has made it to the Birmingham Cross-Country League's Landmark List and is currently in 13th place. His best performance was in Division 3 at Leamington Spa in 2012 where he finished 22nd overall and 2nd 'A' team counter. Entries are now open for the 2019 Northbrook 10k road race which takes place on Sunday 14 July. Now in its 16th year the race will again be accompanied by a children's run and our major charity beneficiary is Coventry Cyrenians. The 10k race starts at 9.40am. Sponsors include Bruker, Coventry Runner, Deeley Construction JPL Heating and Plumbing and Curtain Call. For details of the race vist our Northbrook 10k website. You've done parkrun and are comfortable at 5k, but not too sure about 10k? Come and join in our 5k to 10k training programme. Starts on Thursday 2 May. Cost includes free entry to Northbrook 10k on 14 July. Open to all (age restriction applies). One third of the way through the year and the tables have results form all of the distances. In the Men's table Steve Turvey has taken the lead with five of the eight race distances completed. David Giles, Mike Wheeler, Ian Paterson and Charles Jones head the other men's categories. Natasha White dropped just one point from her five race distances to keep her lead at the top of the women's table. Eleanor Townsend, Lisa Bragg, Claudie Combelas and Ros Myers are the other women's category leaders. The Road Race Champs tables are compiled from Summer Handicap results, and from results of qualifying races sent in to the web site. The 2018/19 Northbrook parkrun cup competition kicked off with the first round draw on 8 September, progressing through the knockout stages and culminating in a thrilling final on 12 January with Tracey Williams (29:20) competing against Martin Gavin (26:20) to win the tournament by 2 seconds. 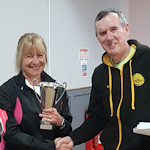 Unable to receive her award at the Club Awards evening, Club Chairman Bob Adams presented Tracey with the cup before the training session on 26 February. Distance training sessions geared towards the Coventry Half-Marathon leave the Jaguar Sports & Social Club on Sunday mornings at 9am. You can check out our distance routes for ideas about training on your own. A range of Club branded running apparel available to members at attractive prices. Visit the Northbrook Kit Shop to see what's on offer. The committee meets every month to discuss Club matters that affect you. The Club Calendar has dates and venues for a selection of some favourite running events in and around the Midlands. Think you may have missed something?